Manic. That is the only word to describe the experience of the Indian Grand Prix, as the Formula 1 circus made its return to the Buddh International Circuit on the back of its inaugural event 12 months ago. That first year had been a bit of an eye-opener – especially because the track facilities were not quite as state-of-the-art as we have got used to at other venues. But even in that unfinished state there had been some charm to it: especially the now infamous 'Stairway to Heaven' that climbed up from race control and went nowhere. After 12 months of work, the Buddh venue was vastly improved: although it was sad to see that those famous steps had been swallowed up by newly completed buildings. 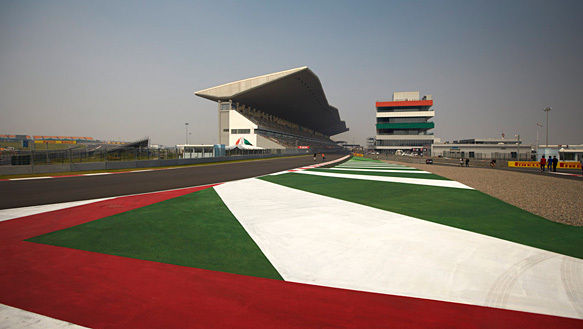 Yet while all was calm and controlled inside the circuit, India retained its 'charm' outside the track as the millions who lived in Delhi and Noida continued their daily business in a way that is a world away from the calm we are so used to in Europe. Cows in the road? Normal. Cars coming the wrong way at you on dual carriageways? Normal. Motorbikes with five passengers (and someone even saw a goat on one) pulling straight out on to busy roads? Normal. And then there was the choking dust and pollution that enveloped the vicinity; leaving a paddock whose members were already being picked off with bad colds or flu gasping for air at various points. The F1 medical centre probably never had so many visitors – as the effects of jet lag and a crazy end to the season started taking its toll on the regulars. 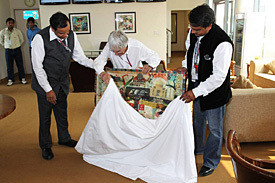 Yet despite the illnesses – and a few were also struck down with 'Delhi belly' – there remains something amazing about F1 being in India. The people are friendly, the culture is amazing, the food is great and it is a place like no other. Roll on 2013. Ferrari found itself on the bad and good side of pushing for causes in India – and both times it hit the headlines. 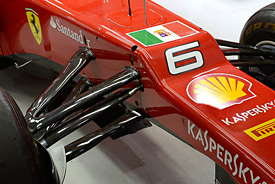 On the down side, the Maranello outfit got involved in a bit of a political situation when it elected to run an Italian navy flag on its car. Such a nationalistic display would not normally raise too many eyebrows, but it came on the back of the arrest of two Italian sailors for having killed two innocent Indian fishermen – who had been mistaken for pirates. While the two sides of that debate continued to flare off in their own directions, Fernando Alonso did something tremendously worthwhile in the build-up to the Indian race when, in his role as an ambassador for UNICEF, he helped its 'Handwashing Day' campaign. Alonso travelled to a school in Turgapur – one hour south east of Delhi – to help educate families about the benefits of washing hands with soaps to prevent diseases. "It's very gratifying to be able to support initiatives that concern the health of children, but I'd be even happier if this was something available to everyone by right," explained Alonso. "As with all sports, Formula 1 wants to get close to the culture of the countries we visit, building up relationships and giving an impetus to solving problems like this one." It only used to be Sebastian Vettel who would regularly change his helmet design, but Lewis Hamilton is now proving just as keen to bring new lids to races. In India, Hamilton was particularly proud of his latest design – which paid homage to the country. 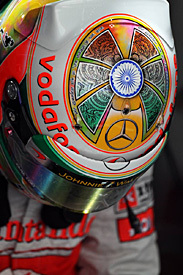 Having been designed by Hamilton himself in conjunction with long-time painter JLF Designs, the helmet featured a roundel from the India flag, a traditional Indian Mandala – and it had colours that were based on the famous 'Holi' festival – where coloured powder is used to cover people celebrating the festival. Written in Hindi across the top was: "If you believe in yourself, nothing is impossible." But it was not just on his head that Hamilton was showing off some new designs – for he was also displaying a new angel tattoo on his right forearm. Having previously been reluctant to reveal much about his body art, Hamilton also revealed that his arm and shoulder also featured a tattoo of the famous 'La Pieta' by Michelangelo. If there is one sport that Formula 1 will never knock off as the number one in India it is cricket. So it was no surprise to see that some of the world's greatest cricketers hooked up with the F1 teams and drivers over the Buddh weekend. Indian national hero Harbhajan Singh, who is also captain of the Mumbai Indians Team, was a guest of Ferrari on race day. "Ferrari means a lot to me, as the most desirable car and a unique symbol of prestige, design and performance," he said. "I am very happy to be here supporting the team and its two drivers, Alonso and Massa." Ahead of the weekend, Mark Webber got a bit closer to the cricket action when he took part in some batting and bowling practice with Gautam Gambhir at Noida International University. "A trip to India is not complete without some delicious food and a game of cricket," said the Red Bull driver. "I am always eager to try my hand at new sports and today was great fun." Webber admitted that his technique was certainly in need of improving after facing one of the world's best. "I was trying to pitch it up a little bit but it was all over the joint," he explained. "It was great to send a few down and it's amazing how much time these boys have got – it's like it's in slow motion to them. "I guess it's the same in any sport: the good professionals seem to have lots of time. It's the same in the car: we make it look easy because we've got plenty of time." Formula 1 supremo Bernie Ecclestone may not be one who cares much for the antics of a birthday party, but even he allowed himself a bit of a celebration on race day as he marked 82 years. Ecclestone invited down all of F1's team principals for a pre-race glass of champagne – before warning them all that he was not anywhere near handing over the reins of the sport to anyone else. "Not at the moment. I still feel good," he said. "When I feel I can't deliver any longer than I will say move on." In fact, while many octogenarians would be winding things down and enjoying some time to relax on a beach, Ecclestone says it is opposite for him, as he cannot get away from the thrill of a deal. "I wish I could slow down," he said. "Places like this, when you see what this was and you convince people to have a race, in the end you get a lot of satisfaction." Who's calling the shots over F1's future?